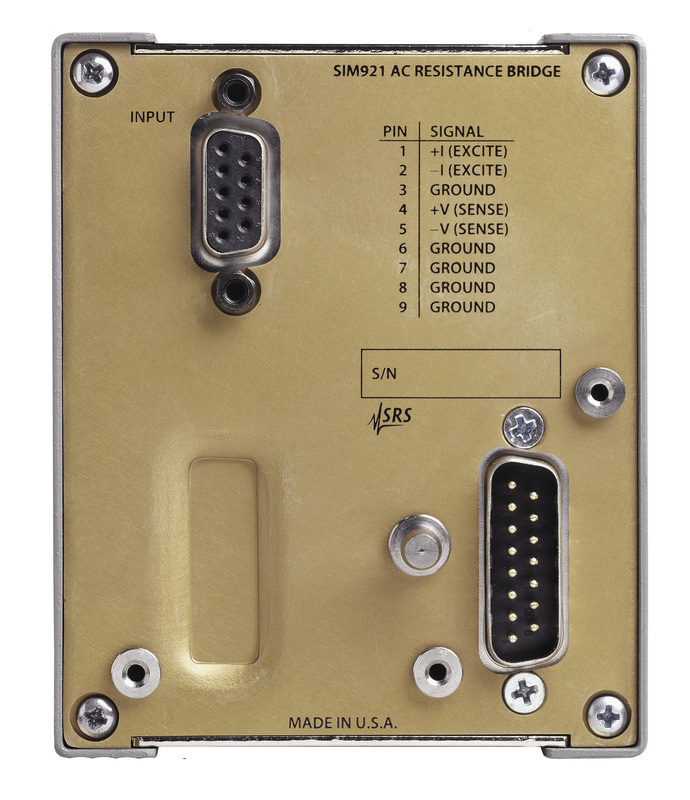 The SIM921 AC Resistance Bridge is a precision, low-noise instrument designed for cryogenic thermometry applications. With excitation power below 100 aW, thermistors and other resistive samples can be measured at temperatures below 50 mK with negligible self-heating errors. The SIM921 measures resistance using a four-wire circuit, eliminating the direct effect of lead resistance on the result. Thermal EMFs and amplifier offset drifts are avoided by using an AC excitation current source. The excitation frequency can be adjusted from 2 Hz to 60 Hz, either from the front panel or over the computer interface. This flexibility allows the user to operate at a synchronous sub-harmonic of the power line frequency (such as 15 Hz/12.5 Hz) or at some incommensurate frequency, depending on requirements. Multiple SIM921s can be operated at different frequencies in the same experimental set-up without risking in-band crosstalk. Also, for very high impedance measurements, the variable frequency makes it possible to probe any capacitive effects in the resistance result. Excitations are sinusoidal, eliminatingthe high-frequency harmonic content associated with square wave excitations. The actual determination of resistance is achieved ratiometrically, passing the selected excitation current through both an internal, high-stability reference resistor as well as the user's device under measurement. An internal autocal is available to calibrate the two arms of the ratio readout for greater accuracy. Two excitation modes, constant current and constant voltage, are available with the SIM921. Most low temperature thermometry applications use negative temperature-coefficient resistors. The constant voltage mode has the benefit of decreasing the power dissipated in the thermometer as the temperature drops. In this mode, the SIM921 servos the applied AC excitation to maintain the selected voltage across the user's resistor. Constant current mode is appropriate when measuring small resistances, such as characterizing superconducting transitions. In constant current mode, the internal reference resistor is used as the input to the servo, giving a constant current equal to the selected voltage divided by half the resistance range (for instance, 100 µV on the 20 kΩ range gives 10 nA rms excitation current). A pair of dual-phase sinusoidal AC demodulators in the SIM921 provide excellent signal-to-noise ratio in the most difficult test conditions. Further, dual-phase demodulation enables resistance and phase-shift measurements. Large phase shifts can warn the user of excessive lead reactance. Selectable post-demodulation time constants from 300 ms to 300 s give you complete control over the trade-off between measurement response time and ultimate resolution. 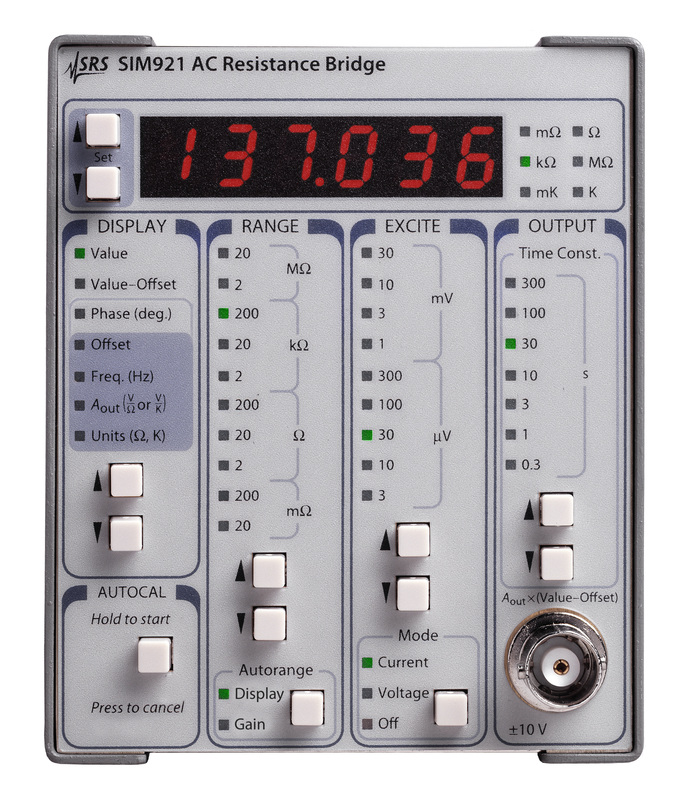 When autoranging is selected, the SIM921 dynamically adjusts the bridge amplifier gains for optimal performance with small signals and rescales the display based on the measured result. By disabling autoranging, the display range is held fixed, and the bridge amplifiers are kept at full-scale gain. This can be particularly important when using the SIM921 in a control loop application. In both autorange and manual range mode, the excitation settings are never changed by the instrument, ensuring the user complete control over measurement conditions in an experiment. The SIM921 is compatible with all resistive sensors including NTC sensors (germanium, Carbon-Glass, carbon-composition, Cernox, ruthenium oxide, etc. ), and PTC sensors (rhodium-iron RTD, platinum RTD, etc.). Up to four user-calibration curves (ohm to kelvin), with 200 points of data each, can be uploaded to the instrument via the computer interface. In addition to the display output and computer interface, an analog output provides a DC voltage proportional to either resistance or temperature. The user has full control over the scale (V/K or V/Ω) and offset (K or Ω) of this output. The analog output signal is well suited to connect with the SIM960 Analog PID Controller. This combination of modules provides a flexible and cost-effective temperature control solution. The primary readout is an easy-to-read 5½-digit LED display (statically driven for low noise). This display can show measured value (resistance or temperature), value minus offset, phase shift, offset, excitation frequency, analog output scale, and cal-curve. Separate bar-style displays indicate the resistance range, excitation, and output time constant, as well as excitation mode (current or voltage) and autorange setting. All instrument parameters can be controlled and displayed on the front panel or set and queried over the computer interface. The analog DC output is available on a front-panel BNC connector. The rear panel has a standard 9-pin D-sub connector for the sensor. Power and serial communications are via the 15-pin D-sub connector which mates with the SIM900 mainframe. Stand-alone operation of the SIM921 is possible by providing ±15 V and +5 V power directly on the 15-pin connector. Resolution is given in the table below. Upper values give excitation current, while lower values are typical rms resistance noise measured at 50 % full scale on a room temperature resistor with a 3 s output time constant.